We take the Alphabet Path seriously around here! OK, so actually, this is the conclusion to an adventure that began back in September. Do you remember our search to find the right dog for our family? Well, in talking to BigBoy, it's not the size of a dog that matters to him, it's the wildness factor. He kept telling us he doesn't like "wild dogs". So, a friend turned us onto Greyhounds. Her daughter has an irrational fear of dogs too but she tolerates and even enjoys the Greyhound that a friend of hers owns. We started researching the breed and found out that they are very docile creatures. They have been described as "lazy" and "couch potatoes" which you wouldn't expect from dogs that are bred primarily as racing dogs. Ex-racers especially make very nice family pets because they are already house trained, crate trained and leash trained. How do I feel about his new addition to the family? I will be honest. I wasn't totally thrilled about the idea. I got my fill of dogs and cats growing up and I loved every minute of it (well, maybe not the minute that one of my cats hanged itself). As a grown up, I have never felt the strong desire to own a pet, even when we used to own a dog a few years ago. He was pretty much Husband's responsibility. I was taking care of babies. But I wouldn't have had that opportunity as a child if my parents hadn't so generously allowed me (including bringing home a stray cat named Idgie from my first year at college and keeping it for me when I returned the next semester). So, even though I know it is a sacrifice on my part to put up with the mess and extra responsibility that a large indoor dog brings, I want to be as generous with my kids as my parents were with me in this area. And she is very sweet! For the stats: her name is BeeGee, she is classified as a red but is fawn colored and she is 7 years old. She really does have tattoos in her ears identifying her breeder and litter information. She used to race down in South Texas and actually won once which the kids think is really cool. BigBoy is still a little nervous when she decides to explore the house, but he was petting her on the floor last night and giving her kisses before bed so I think he'll be fine. oh my gosh! ADDITION. Truly I am not as stoopid as I appear in comments. Really. What a great dog! And a very humanitarian act on your part too! I've heard horror stories about what these poor dogs go through when they retire. My oldest is very nervous around dogs too. When we're ready for a dog, I'll have to look into this! She's beautiful! It's so nice when someone rescues an animal. I love greyhounds and BeeGee is beautiful! I'm so happy for you. Greyhounds are my favorite dog breed, and shockingly as a veterinarian the only breed I can handle living in my house. They are amazing. 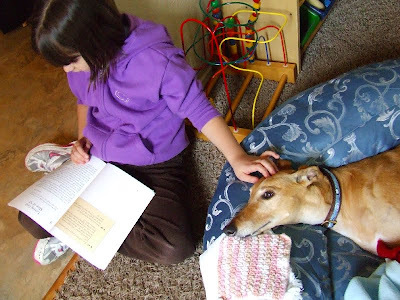 We had a retired racer for about a year a year ago, but he just was not happy around young children (though many and most are great with kids) and we had to give him back to the rescue society. Since our daughter was due any day we didn't want to add another family member at that time and adopt another dog. They are such a beautiful and sweet breed. You have my contact info if you ever have any questions, feel free to ask. Congratulations, Charlotte, on your dog--she is very pretty!! Lovely. My aunt has had whippets for years, a relative of the greyhound. Such graceful animals. How generous of you to allow your children this pleasure. My kids would love a pet, but I am definitely still in the taking care of small children phase of life and have nothing left to care for animals. Some how I missed this bit of news -- where have I been? What a great dog! We considered a greyhound also, but we have an unfenced yard and lots of squirrels which would make for a dog chasing them down the street at 40 mph! I have heard that they are very gentle -- good choice!